I commend Patty and the countless others across the country who do this difficult, but loving work. It cannot be easy to assist families and patients in this way day after day. I’m sure it’s a very emotional thing, and yet very rewarding and appreciated. Thanks for sharing this, Bernie. You’re welcome. I agree Wendy, we are fortunate to have such people that are able to serve humanity in this important way. 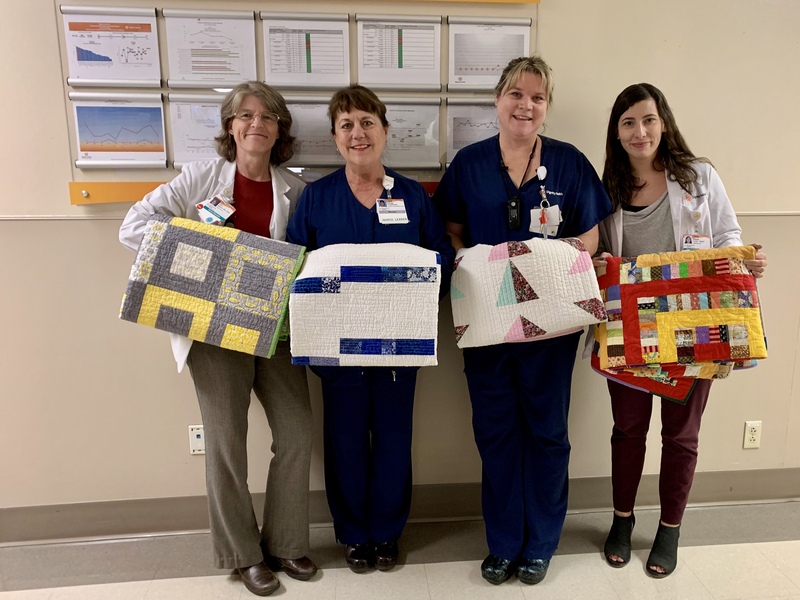 Thank you for the update and more information about how the quilts are going to be used. 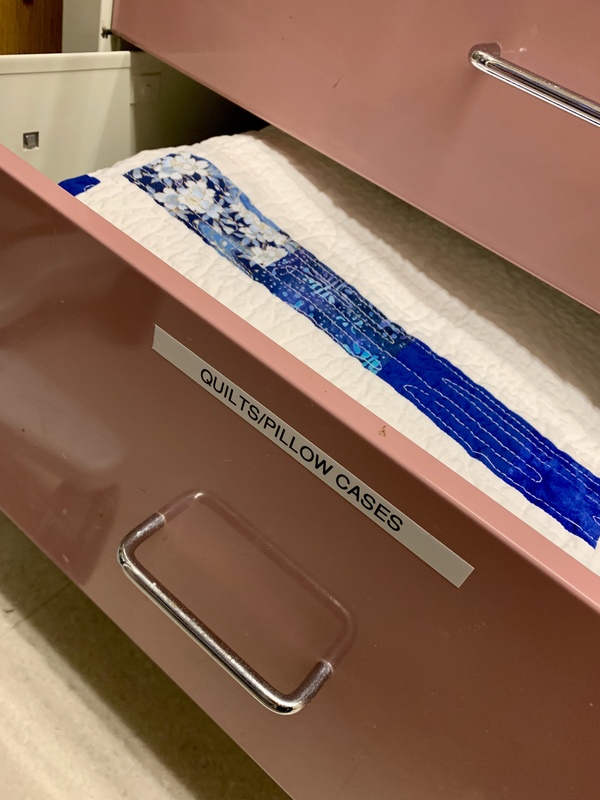 I am in awe of people who are able to work in the medical field, honestly, and I deeply appreciate the care that this team puts into their work. Thank you for facilitating the exchange. Thanks for introducing us to some of the hard working folks at Mercy who do this important work. I love the photo of them holding the quilts! Isn’t the picture so sweet Louise? 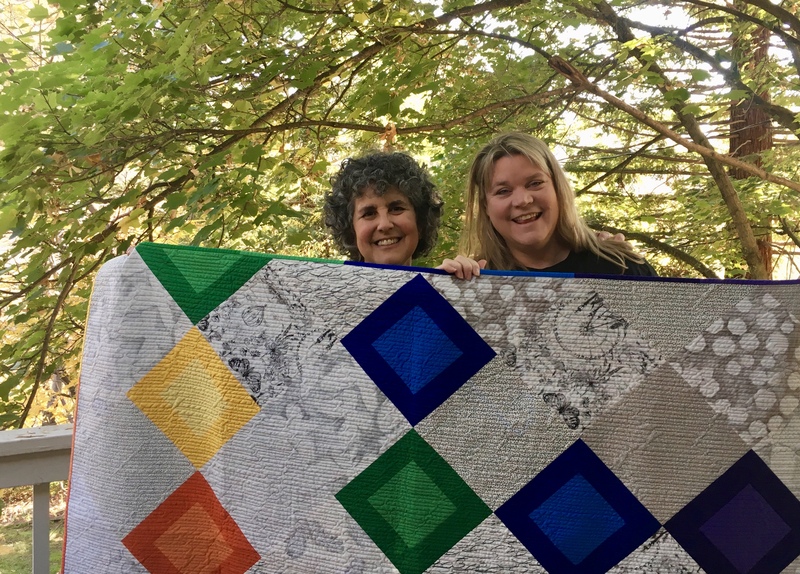 They look so happy to have these beautiful quilts to offer. Happy Thanksgiving to you and your husband! I think you should be able to share the link without any problems Roseanne. I am sorry to hear about your sister. That must have been a terribly painful period in your life. Take care. People who can comfort those who are critically is is certainly someone special. I have seen hospice workers who help loved ones at home be comfortable during their last days on earth and always wonder how they do it. I’m afraid I’d would be to emotional and wouldn’t be of much help. This is a great thing you guy’s are doing. I’m sure you will receive some blessing for it. Hi Cherie, I agree that it takes a special mindset to deal with terminally ill or dying patients. I don’t think I could do it either but I respect the need. I love these sorts of projects where I can see the need being filled and how appreciative the recipients are. It is very satisfying. Have a great day. Bernie thank you for the update. I bawled all the way through it. It is so uplifting and touching to read how compassionate those folks are. I just finished sewing on the binding to my contribution. In the morning I will finish hand-sewing the binding, have my hubby model the quilt for photos (lol!) and box it up to mail. We will take it to the PO tomorrow. Yes I would be happy to make a Quilt of Valor . 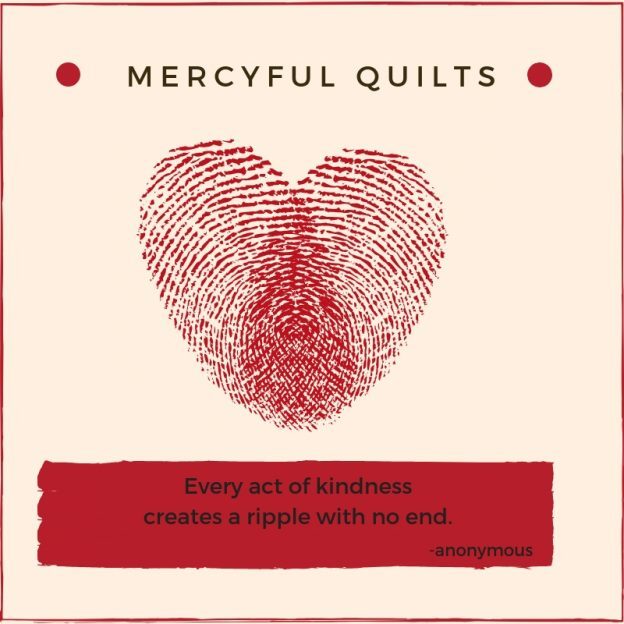 It may be after the holidays, but I would like to continue to contribute to Mercyful Quilts. Is that a new logo for Mercyful Quilts at the top of the post, one I could copy and put on my blog? Good morning Robin, Thank you for your comment. It is probably really interesting for you to see how things change over time with respect to patient care. I think this is so important to support patients and their families at the end of life stages. But I totally agree, working in oncology or hospice would be very difficult for me. The medical professionals in these fields are unique in their ability to care for terminally ill people. Bernie, honey, you just blow me away, as does the palliative care unit at this hospital. I had no idea this was done. I wonder how many other hospitals make such grandiose efforts. This post was so well written, full of valuable information, and very uplifting. Thank you so much! I am not sure how many hospitals do this to the same level of care but I hope there are a lot. It is an important process that should be supported and respected as best we can. I am glad the post was meaningful to you. 🙂 Have a great day Karen. They had a program like this at the hospital where my mother in law passed away in Longmont, Colorado. No quilts, but food, coffee, and anything she wanted. It made such a difference to all of us. Not a happy time, but it made things easier on all of us. This is a great program to support, Bernie, and thanks for brnging it to all of our attention. A great cause doing great work. Thanks for organizing. Thank you Anja. I agree – it is a great cause and I am so happy to support it. Take care and enjoy your Sunday! No problem! I am just happy knowing it is coming our way – it takes the fun out of quilting if you feel like you have to hurry. So, enjoy the process and send it when you are finished. I look forward to seeing it. Happy Thanksgiving!! !